Set in beautiful Mid Wales countryside, Derwen House is a recently restored 19th Century Dower House. 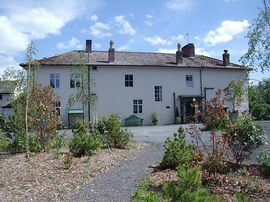 Lily Cottage is the part of the house which previously held the stables. 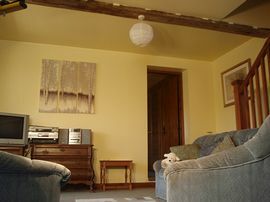 Exposed beams,tasteful furnishings and decorated to a high standard. The cottage is adjacent to the owners Derwen Garden Centre derwengardencentre.co.uk. A branch of the renowned Dingle Nurseries. Holiday tenants are granted a 10% discount throughout the garden centre,including the licensed restaurant. Local attractions Powys Castle, Lake Vrwnwy, Llanfair Caerienion Light Steam Railway. Welshpool Canal Museum. 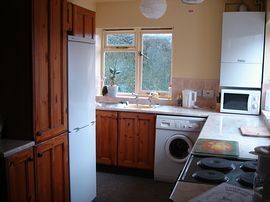 1 Double Bedroom and Bathroom on Ground floor. Large garden with patio and BBQ. 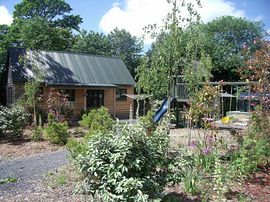 Outdoor play facilitieS. Games room. Local Services: Village of Guilsfield half a mile, two excellent pubs,spar and post office. with shutes and wave machine. Shops and restuarants. After 2mls turn right for Guilsfield (The Garden centre is signposted with a brown tourist bard sign at this point). The Garden Centre is the first on the right. Collect the keys from there. 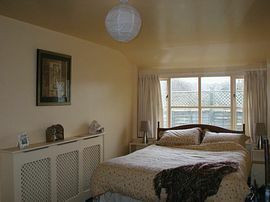 Short breaks available except in peak season. Please contact owners for price details.